The automotive industry’s demand for lightweight steel makes it challenging to mass produce quality Advanced High-Strength Steel (AHSS). Installing S12 panel PC for manufacturing AHSS has the interoperability and sturdiness necessary to augment a steel-making process. With 12.1” panel computers, steel-manufacturing is more efficient which results in high production rate without significant cost increase. Environmental and energy regulations are becoming more astringent for the automotive industry. There is a need to reduce fuel consumption of cars by using lightweight materials to decrease an automobile’s mass. However, compared to other materials, steel costs lower. So, steel producers developed advanced high-strength steel that has higher strength and more lightweight. Technically, mass producing an AHSS is no easy task. Computing devices can be used to aid the operations, but it takes more than a typical panel PC to optimise steel manufacturing further. However, our 12.1” industrial-grade computer can have the specifications to take AHSS production to the next level. The prominent features of our device are its IP69K protection rating and -5°C to +45°C cased operating temperature. These features guarantee that the device can last for an extended period under harsh environments. What makes the S12 embedded PC exemplary for steel-production? Discover the features that make it suitable for producing steel for the automotive industry through this blog. Finding the best computing system for automotive steel operations requires looking for a device that is sturdy, compact and operator-friendly. Advanced PCs such as an S12 industrial computer certainly meets these requirements, and it helps in mitigating the risks in steel manufacturing plants. Our 12.1-inch ruggedised panel computer exceeds the requirements for optimising steel production. We have a projected capacitance touchscreen option that provides high resistance to scratches and responsiveness even with gloved hands. What’s more, it is compact which saves up the workspace, and it has varied serial and USB port options for interoperability with another equipment. 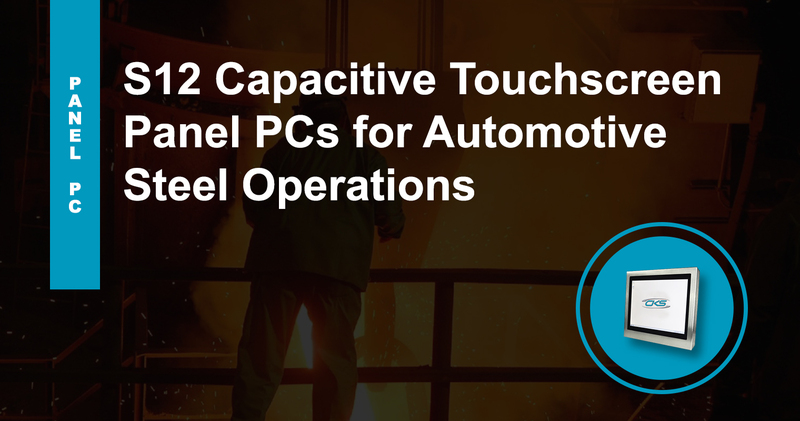 In the next section, find out more about how our S12 capacitive touchscreen PCs stand out from other industrial–grade devices? S12 Panel PC versus Other Enclosed PCs – Which is Better? Based on the table, our S12 ruggedised computer has the ideal features that can further improve an automotive steel production. The Intel® Baytrail-M/D™ J1900 2.00Ghz CPU can support multiple cores for better computing performance. What’s more, it has minor power consumption without performance decline. This means more energy can be allotted to more massive machinery. It also makes it the right computing device that can be attached to heavy equipment. Also, its projected capacitive touchscreen option provides additional scratch-resistance on the screen. Being a top-rated touchscreen technology, gloved operators can seamlessly navigate applications. Lastly, our device has a Watchdog Timer which is necessary for every industrial usage, thin client options for space-saving and Wi-Fi capability. Indeed, the future of automobiles is being shaped by strict environmental and safety standards. Moreover, to stay on top of the demand, automotive steel manufacturers must be keen on utilising advanced computing devices. Aside from that, installing this device means future-proofing steel production system for the automotive industry. Contact us today through (+44) 014 3874 7111 or download a FREE datasheet of our product.